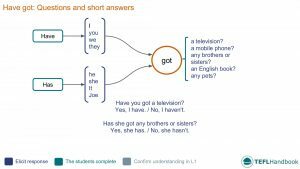 A collection of ESL activity and game ideas for teaching 'have got' style questions to beginners. These can be used either as a stand-alone lesson plan or to supplement an existing one. The recommended way to view these materials is through the TEFL Handbook app, which gives you offline access to everything on the site. The example ESL board work below attempts to give a visual representation of the target language for this lesson. Most learners at this level have difficulty with word order and the verb conjugations. As always, use the colour-coded board text to help you think about what parts you should attempt to elicit. 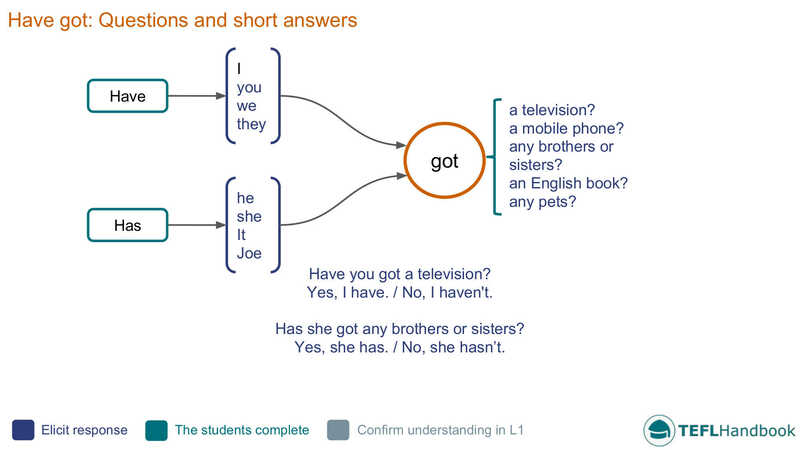 If you have competency in your students' L1, you could also have them translate some simple sentences to confirm their understanding. The students will use the target language to ask and answer one question. Refer to the board work if you have used it and tell the students that they will have to make and answer one question using this lesson's target language. Students will ask a question to their classmate on the right until everybody has had a turn. You start by asking the first question. For this pair work activity, students will use the grammar from this lesson ask about family and home life. In pairs, the students will now interview each other using 'have got' style questions. You should monitor and correct any mistakes. You will ask follow-up questions related to the previous activity. Teacher: Has she got a brother? Student A: Yes, she has. Student B: No, I haven't. Student A: Sorry! No, she hasn't. Our suggestions for ESL games and activities require the minimum of resources (whiteboard and markers) and are perfect for low-resource classrooms. Teams have to remember details from the previous activities to win points. Start by dividing the class into two teams. On each turn, you will ask one of the teams a 'have got' style question related to a previous activity. The other side wins a point if they guess the correct answer. Teacher: (With three members of team B) Have they got sisters? Team A: Yes, they have. Team B: No, we haven't. Our suggested next lesson is on how to describe people. If you've found these materials useful, be sure to check out our full list of ESL lesson plans for beginners (A1 Upper), as well as our complete selection of EFL - ESL lesson plans. If you use an iOS or Android device, have a look at the TEFL Handbook app. An ESL lesson planner for English teachers. It has a lot more content and gives you faster access to our ESL resources, making it easier to use in class.